For over 20 years Fred, Master Steeplejack and expert chimney feller, would often relate to Alan dramatic stories of steeplejacking lore and particularly chimney drops in either the Engine Shed or the ‘hen-hut’ workshop. Nationally renowned Master Steeplejack, Fred Dibnah was born on the 29th April 1938 in the Lancashire cotton town of Bolton. Even as a young lad, Fred was considered by his family and also his contemporaries as being a little odd, rather eccentric, for the young Boltonian eschewed the normal football and similar sports-related pastimes in favour of the world of steam engines, boilers and in particular the numerous cotton mill and factory chimneys that were as ubiquitous as blades of grass. For the young Fred Dibnah was captivated by the gigantic, gleaming steam engines with their enormous whirling flywheels that powered the cotton mills and that were jammed cheek by jowl into Bolton’s townscape. Fred also had a profound interest in the many classes of steam locomotives that regularly clanked by close to his boyhood home in Burden Park, and he regularly visited Bolton Loco Depot, where he would spend hour upon hour, fascinated, watching and studying the various steam shunting locomotives and goods engines stabled at the sheds. Fred clearly loved all aspects of British industry and was fascinated by the numerous ancient coal pits with their distinctive headgear that he saw when taking a regular walk along the towpath of the Manchester, Bury and Bolton Canal. Indeed, many years later when he became famous, he would delight his audiences with his colourful reminiscences and adventures regarding the Lancashire coal mining industry. Fred’s greatest passion however, was industrial chimneys and steeplejacking, which had thrilled him from being a small lad when he had witnessed, during the local wakes weeks when the cotton mills closed, the sight of steeplejack’s’ red-painted ladders running up the sides of the towering mill chimneys and the tiny ‘Lowry-esq’ figures, the steeplejacks ‘dancing around’ on the platform some 200 feet up in the sky. By the early 1960s the cotton industry and its ancillary trades were in a severe downward spiral of decline. The demise of this once prominent industry (in the nineteenth century the boast of Lancashire’s millowners was: ‘England’s bread was won by Lancashire’s thread’), was excellent at first for the young Fred Dibnah whose ambition and most fervent desire was to become established as a steeplejack. The numerous mill and other industrial chimneys scattered all over Bolton and the other neighbouring Lancashire cotton towns all radiating out from the hub: (Manchester, known as the cottonopolis), which for decades had been beautifully engineered and subsequently regularly repaired, would from now on require to be demolished. Fred regarded these mill chimneys as monuments to the industrial age. He held these towering structures with great affection and he often related stories about the ‘hard men’, the chimney builders who erected them and of the men also, who maintained and repaired them: the steeplejacks. As Fred eloquently put it, “these chimneys had served their masters well; they were no longer loved and had therefore to be done away with: demolished”. But to just place an explosive charge in the chimney’s base and blow them down when they came to the end of their lives, did not appeal to Fred, for to him there was another more traditional way of felling these chimneys that embodied respect for the old time chimney builders – and would demolish them with great aplomb and not a little drama. Fred Dibnah’s procedure for carrying out a chimney felling was the result of a well considered demolition plan, based on traditional Victorian practice known in steeplejacking parlance as ‘gobbing out and pit-propping’. Fred termed it as ‘the science of back’ards construction’. By the employment of this tried and tested procedure, Fred almost made it into an art, because from the early 1970s his fame as an expert chimney feller became renowned. His deep-seated knowledge of chimney construction and of steeplejacking lore, his charismatic and competent showmanship rapidly made him nationally famous: particularly following those memorable early BBC television programmes. His name became synonymous with the stereo type no-nonsense, straight-talking Northern character, and of craftsmanship, hard graft and of daring-do. Fred’s later television series particularly made his character blossom, his passionate and oftimes comical descriptions of how the complexities of historic mechanical wizardry were built and how they operated, thrilled his television audiences nationally. He was a most brilliant, natural speaker, and especially gifted in being able to ‘paint a picture’ in his distinctive Boltonian accent. Fred was awarded two honourary degrees: the first was from The Robert Gordon Institute of Technology, Aberdeen, and the second from The University of Birmingham. Thereafter, he was Doctor Fred Dibnah. In July 2004, Fred was awarded the M.B.E. for services to television and broadcasting. On the 6th November 2004, Fred died after bravely battling with bladder cancer since autumn of 2001. I knew Fred and I know Alan too and this book gives an insight into the admiration the latter had for the former. Alan faithfully acknowledges the skill and craftsmanship of Fred Dibnah and portrays evocatively the sentiment in Fred’s heart as yet another magnificent monument to Victorian Engineering thunders, inch perfect in position, to the ground. Those of us who attended many of these Lancastrian Sunday morning spectacles will already know and recall the techniques, the preparation, the informality of those early occasions (all so well described by Alan including a brief and clear account as to how it’s done) but few will remember the name of the mill, the goods it produced, the plant inside the engine house walls and the conversations we had with those around us as we stood waiting with baited breath for the chimney to tumble. But Alan has it all here and for me this is the true subject of the text. Alan tells a wonderful tale using the event of the chimney drop as a reason (or an excuse perhaps) to tell the tale. He brings the text alive with anecdotes and quotations aplenty but his writing is so eloquent he brings the day itself alive. Alan had also spent time with Fred and some of his close colleagues during the preparation of the `drop’ and describes expressively the situation, the history and work involved. The text covers 28 different ‘chimneys’, all but about 5 of which stood within a 12 mile radius of Fred’s own home, indeed a handful were within walking distance. The first account is of a chimney drop in early 1970 and the last, a painfully sad occasion for all who knew Fred personally, knowing that it would be his 90th and last, in 2004. Whilst the preparations of each, and indeed the occasion itself might be similar to the last, each and every one is an entertaining and thoroughly enjoyable read. I would recommend this eminently readable book to anyone with any interest in industrial archaeology, in Fred Dibnah himself or in less conventional ways of the world. This is a hardback book, 215mm x 300mm, with 200 pages and 275 colour and black & white illustrations. 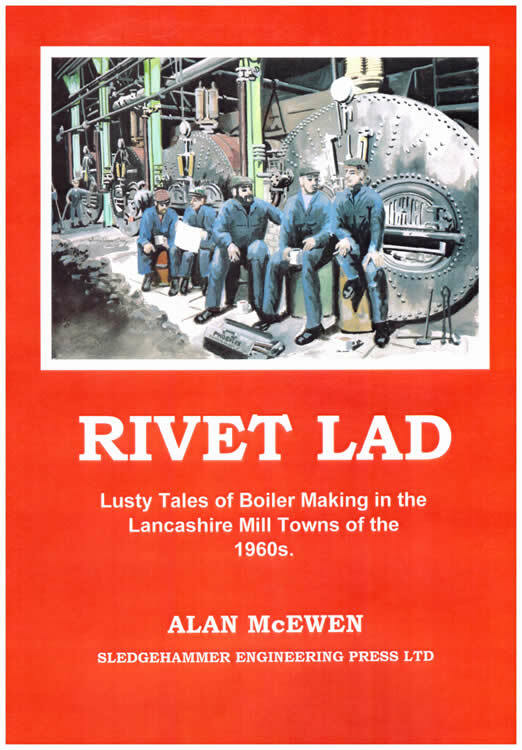 Author Alan McEwen was a close friend of master chimney demolition expert Fred Dibnah for almost 25 years. He has passionately and vividly written this excellent book that chronicles 28 of Fred’s amazing and often exceedingly dangerous chimney drops. The book is extensively illustrated in both colour and black & white with some spectacular action shots. This is a nice book to own if you were a fan of Fred’s or simply interested in entertaining stories about his exploits. 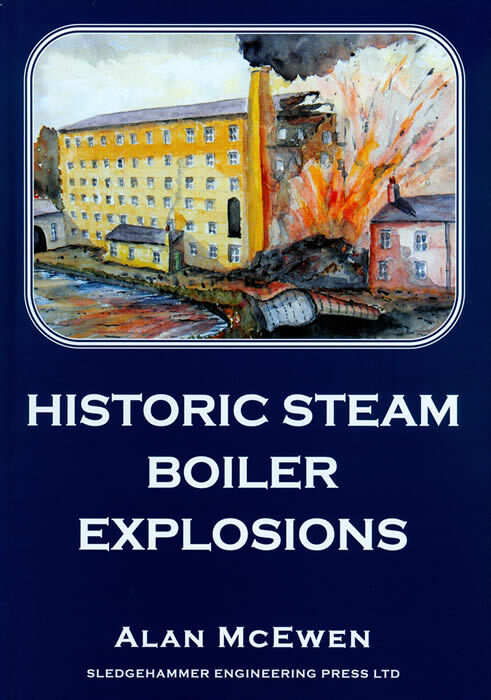 It would make a good present for someone into industrial history. It is broken down into stories about individual chimney demolitions, with illustrations of the mill and often of the chimney drop itself, as well as Fred. The stories are surprisingly exciting, coming from a time (not that distant) when Health & Safety didn’t stop you from getting on with the job. It’s a book you can dip into but it’s much more than a picture book, and tells tales that needed telling. 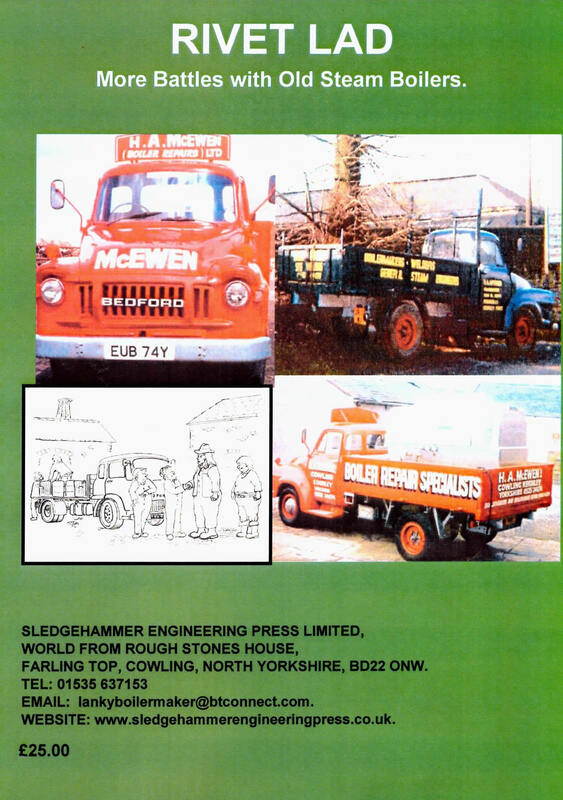 Well-known boilermaker (now retired) and author Alan McEwen has written a book on his good friend and Master Steeplejack, the late Fred Dibnah who died in 2004. Alan knew Fred for many years and Fed would regale Alan with stories of steeplejacking and chimney drops, embellished in a way that only Fred could do. With a passion for industrial chimneys and steeplejacking, the young Fred would watch the steeplejacks at work during wakes weeks when the mills closed and his interest developed into a passion and a business, albeit one where he dropped many of the chimneys he had watched being repaired. As Alan writes in his introduction to the book: “Fred regarded these mill chimneys as monuments to the industrial age. He held these towering structures with great affection and he often related stories about the ‘hard men’, the chimney builders who erected them and of the men also, who maintained and repaired them: the steeplejacks. As Fred eloquently put it, ‘these chimneys had served their masters well; they were no longer loved and had therefore to be done away with: demolished’. But to just place an explosive charge in the chimney’s base and blow them down when they came to the end of their lives, did not appeal to Fred for to him there was another more traditional way of felling these chimneys that embodied respect for the old time chimney builders and would demolish them with great aplomb and not a little drama”. Fred became famous through a TV series on his methods, using well tried Victorian practice of ‘gobbing out and pit propping’. Alan continued: “His name became synonymous with the stereo type no nonsense, straight talking Northern character, and of craftsmanship, hard graft and of daring do. He was a most brilliant, natural speaker, and especially gifted in being able to ‘paint a picture’ in his distinctive Boltonian accent”. Alan’s book, published on 15th October 2008, describes no less than 28 of Fred’s chimney drops and with Fred’s ‘antics’ coupled with Alan’s ability to tell a tale – this substantial book (A4 hardback, 200 pages with 275+ illustrations) is sure to be in demand. If you haven’t already read about him in the Middleton Guardian’s popular Bygone Days pages, Alan McEwen is fast becoming Middleton’s very own Fred Dibnah. 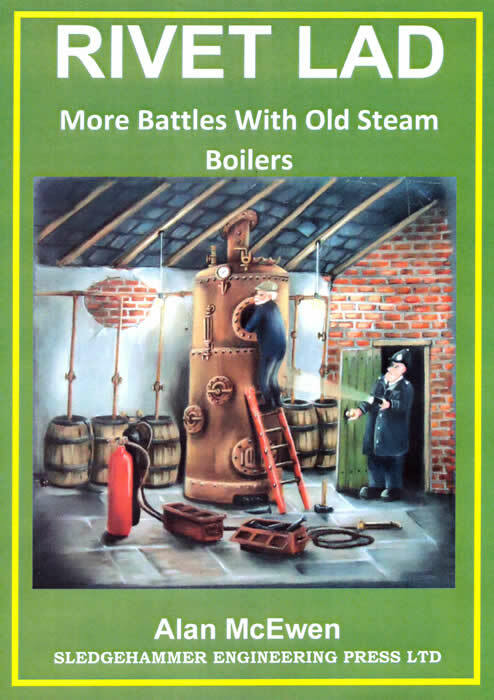 The Middleton boilermaker has appeared on Fred’s many TV programmes about steam engines. As one of the famous Bolton steeplejack’s oldest friend, Alan McEwen has a unique view of the life and work of the late Fred Dibnah, illustrated by many of Alan’s own photographs. 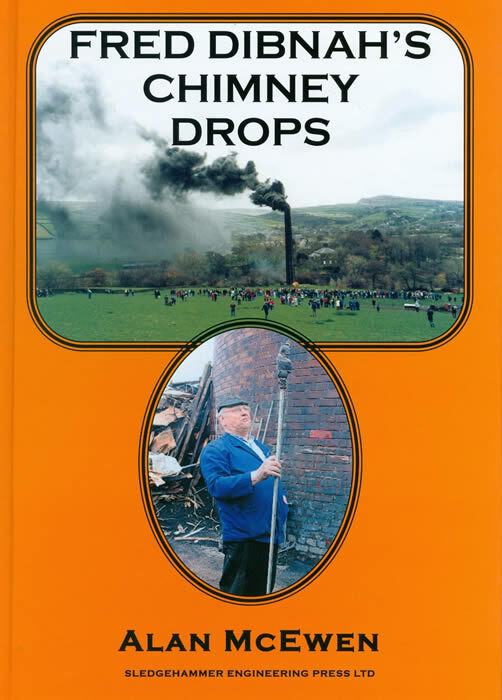 Dedicated to the memory of Fred Dubnah, it charts the progress of Fred Dibnah’s chimney drops from 1970 to 2004, interspersed with valuable old photographs, personal memories of the man himself, quips and some tall tales. One very interesting section of the book describes Fred Dibnah’s old style ‘gobbing-out and pit-propping’ chimney demolition procedure in detail. It was a method fraught with danger, which Fred used with consummate skill. In many of the photographs Fred appears as a character out of time. Wearing his early trademark stove-pipe hat he is the epitome of the great Victoria engineer Isambard Kingdom Brunel as he works to reduce 200 feet of old mill chimney to rubble. Later photographs show Fred wearing his more recognisable flat cap. But throughout it is a unique account of the great man. 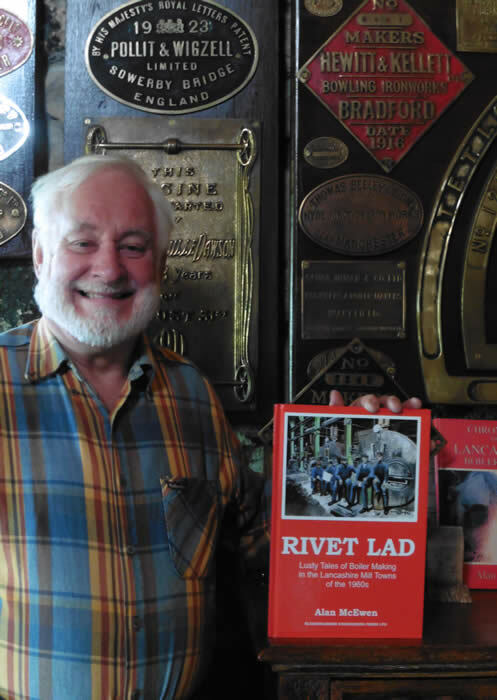 JUST published, Fred Dibnah’s friend and well-known boilermaker Alan McEwen has produced the first book of its type to concentrate purely on the famous chimney drops that became steeplejack Fred’s trademark. Alan guides us through 28 nerve-tingling chimney ‘jobs’, in chronological order from 1970 to that last drop in 2004 at Park No. 2 Mill, Royton and all are well documented and described – the author accompanying many of the drops himself upon his friend’s invitation. Printed on quality art paper, this brings out the best in the photographs of preparations such as the pit propping and ‘gobbin out’ procedures utilised by the master. Its pages are peppered with original photos of the buildings and their chimneys in their heyday where appropriate and the close-up shots of the drop preparation do give one a feeling of actually being there with him. 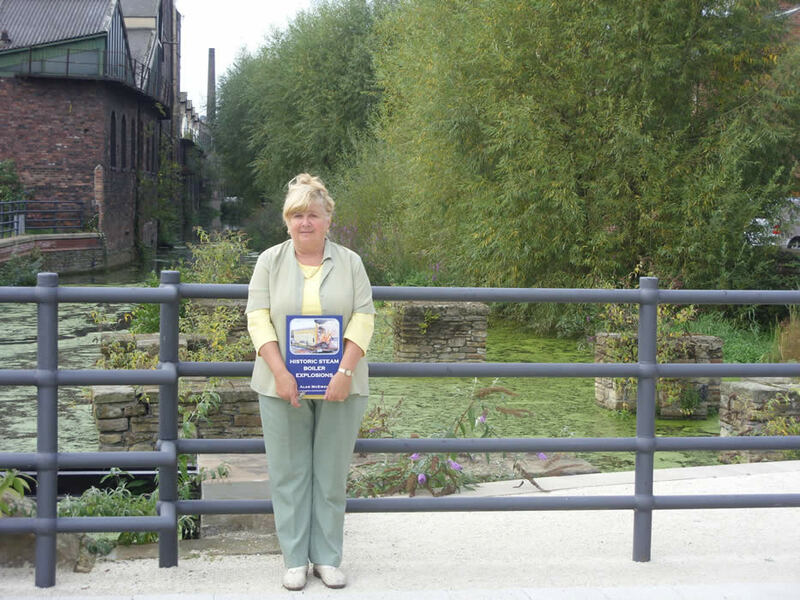 As well as being a perfect record of a large part of the late Fred’s life, it is also Alan’s own tribute to a dear friend, of which Alan recalls trundling round the industrial gems of the Lancashire/Yorkshire border searching out old lead mines, water mills, chimneys and mill complexes. This is a weighty tome – and is not at the budget end of the market – but it is Christmas and if you’re a Fred fan or an enthusiast for our industrial heritage then this book really should be on your wants list. There are some books about a person and their work can only be written by an individual with a similar background both in industry and the life to that person, and their work. This is a case in point. Alan McEwen’s writing style and respect for accurate documentation serve to make a very interesting book even more interesting. I look forward to more works from Alan.